Wireless expense and mobility device management leader recognized by AOTMP with 2012 Efficiency First® Framework Supplier Adopter Award. 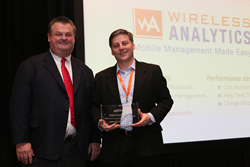 Wireless Analytics, provider of outsourced mobility managed services, has been presented with AOTMP's 2012 Efficiency First® Framework Supplier Adopter Award at this past week’s AOTMP 2013 conference in Orlando, FL. The award recognizes one AOTMP supplier company for embodying the values and philosophies of the Efficiency First® Framework. Eames cites increased billing efficiencies, improved user productivity and streamlined mobile IT management processes as some of the additional benefits clients receive from wireless mobility management best practices. In addition to the Efficiency First® Framework Supplier Adopter Award, Wireless Analytics has been recognized by AOTMP in past years for ranking among the top 3 in customer satisfaction among wireless mobility management companies. AOTMP is an information services company focused on establishing and maintaining high-performance, best-in-class fixed and mobile telecom environments. Partnering with enterprises and industry suppliers, AOTMP uses information and analytics to drive efficiencies, performance and productivity. For more information about AOTMP, visit: http://www.aotmp.com. Supporting the mobile workforce since 2003, Wireless Analytics works directly with senior management to make wireless mobile management easy and efficient, giving them the tools to enable employees to work anywhere and anytime. Our CLEAN Platform™ (Carrier Lifecycle Expense Analytics) empowers businesses through easy access to wireless performance metrics. For three years running, Wireless Analytics has been ranked among the highest in customer satisfaction by AOTMP. To learn more, please visit http://www.WirelessAnalytics.com.